The West Coast Avengers wake up to another fun day of adventure when giant Tigra returns to literally tear the roof off their headquarters. And things go downhill from there. B.R.O.D.O.K. has brought down his wrath in the form of Tigra and five other kaiju-ladies, and he's set on devastating Los Angeles from the coast inward. The Avengers scramble to meet the threat after doing more than their fair share of snarking. The monster fight develops in straightforward ways. Kate, who doesn't normally betray such narrative short-sightedness, manages to get herself into a one-on-one lair showdown with B.R.O.D.O.K. That launches a twist ending and a new complication for the next issue. Along the way, a few team members are blessed with minor developments. Johnny "Fuse" Watts brightens up his "ask me about my mysterious origin" sign a few more notches. Gwen's reality-bending powers go MIA, leading to potential trouble with Quentin. And Clint and America are just there, quietly attempting to glue the team together with solid tactical leadership and world-class punching abilities. Visually, this issue gets as much mileage as possible out of its all-fighting premise. The action is exciting but easy to follow, and smart layouts zoom in on the heroes' faces admirably for key expressive moments. The colour work is top-notch; it highlights the nigh-insane amount of detail invested in the big outdoor fight scenes. As in #2, Kate's storyline diverges from her teammates. Unlike the previous issue, though, this one's WCA shenanigans fall short of Kate's in terms of interest and engagement. If you dared take scissors to this comic, I think you could transform it into a tighter, more compelling solo story by excising the eight Kate-free pages. This is a pretty big problem. If the rift between Kate and the team deepens further - if this title becomes not "West Coast Avengers" but "Hawkeye guest-starring her couch-surfing d-list pals" - then I think its days are numbered. But there is a silver lining! The plot is already bending toward a solution by the final scene of this issue. Hopefully, I'm not spoiling the twist ending much if I say that it guarantees a direct conflict between Kate and her teammates. If #4 sticks the landing and resolves that conflict well, the West Coast Avengers will come together as a team with some real longevity. 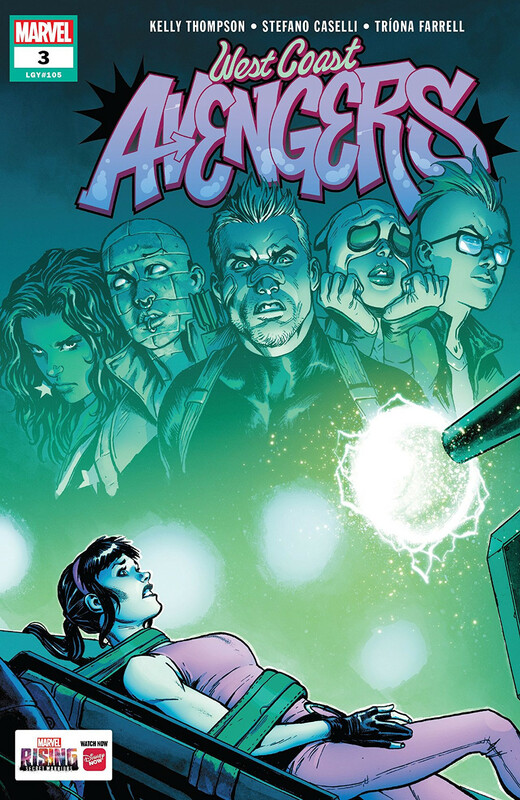 West Coast Avengers #3 forces readers to confront the fact that the team doesn't work so well (from an entertainment standpoint) without a fully-engaged Kate Bishop. Though the twist ending strongly suggests that Kate's rabbitting tendencies will be recognized and resolved in the next issue, a strong arc conclusion isn't going to retroactively elevate #3 to greatness. Man, the West Coast Avengers get downright callous when they visit the "what sort of idiots come out to rubberneck a giant monster fight?" humour well too often.